Every movement of social change in history has been met with some sort of backlash. New ideologies arise to discredit movements and to send us backwards in order to maintain power structures and the status quo. We’ve seen it happen with the increasing sexualization of women since feminism first began, and the “War on Drugs” and skyrocketing incarceration rates reminiscent of slavery and the Jim Crow era. And now, on this campus, we see it in the “yellow shirts” in support of the current, discriminatory hiring policy. While I recognize the freedom of speech and expression of the individuals with the yellow shirts, I also recognize my own freedom of speech and expression for calling this behavior what it is: oppressive. For me, the debate about the hiring policy isn’t about theology, the Bible or tradition. It isn’t actually a debate at all. It’s my life, my identity, as well as one small manifestation of the way the world values my life as a queer woman. When it comes down to it, we’re not arguing about policies or interpretations of the Bible and we’re not arguing about politics, ideologies or religious freedom. We’re arguing about people; people like me. People I love bottomlessly and would die for, people I call my siblings, people who nurture me, who give me the strength to be as brave as I am, to be as out as I am. People who deserve basic human rights, dignity and respect, because we are just that: people. What the yellow shirts, and even the Open Letter shirts, communicate to me is that as a collective body of people, we believe that LGBTQ/queer identities are debatable, that everyone has some sort of claim in seeing what they want to see in LGBTQ people, that our humanity is subjective and that everyone, even those who support us, can and should have an opinion about us. This isn’t about whether or not you believe homosexuality is a sin, and frankly, that doesn’t even matter. This is about our access to jobs, to housing, to life. It’s about whether or not we’re human. To debate that, in and of itself, is oppressive. 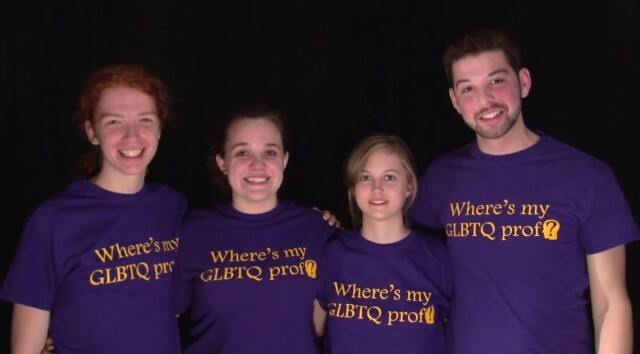 When I see the yellow shirts, I will be reminded again and again that to view LGBTQ people as inhuman is safe and justified on religious grounds on this campus and elsewhere. I will not see tradition, or Leviticus 18:22, or the reflection of what the individuals wearing these shirts think is right. I will see my oppression scrawled across their chests. I will see every battle I’ve fought with myself about my sexual identity. I will hear the word dyke ringing in my ear. I will feel that push, that whisper, that slur, that violence I’ve lived through so many times. I am not offended by the statements these shirts are making, I am harmed by them. I want you to ask yourself, whether you wear the purple shirt, the yellow shirt or neither, do you believe that your opinion of me and my community should matter so much that it affects our very livelihood? If the answer is yes, I want you to evaluate just how much trust and dependency you put in your privilege; I want you to look at me and the people I love in the eyes and tell us our bravery is futile, that our identities are up for debate, that we are controversial. And I want you to know that we have been fighting for centuries, that we are as brave and strong as ever, that we know ourselves, we love ourselves and no amount of oppression or backlash will ever take that away from us. In fact, I dare you to be as brave as we are everyday.